The announcement coincides with the release of a new report showing that northeast and mid-Atlantic states can achieve a 29-40 percent reduction in transportation emissions by 2030. The six jurisdictions (Connecticut, Delaware, the District of Columbia, New York, Rhode Island and Vermont) will work together on the new policies through the Transportation and Climate Initiative (TCI). The TCI is a collaboration of 12 northeast and mid-Atlantic jurisdictions that have been working to develop the clean energy economy and reduce carbon pollution from the transportation sector since 2010. Until now, TCI has focused on supporting clean vehicles (including ambitious multi-state efforts to deploy electric vehicles), investing in transit, and promoting sustainable communities. “I am proud to join my fellow governors and Northeast states in working toward a regional agreement to curb the devastating effects of climate pollution from the transportation sector,” said Vermont Gov. Peter Shumlin. Today’s announcement coincides with the release of a new report by the Georgetown Climate Center, which finds that clean transportation policies could cut carbon pollution between 29 to 40 percent in the TCI region by 2030. A comprehensive implementation of these policies by TCI states could bring net cost savings of up to $72.5 billion over 15 years for businesses and consumers, along with tens of thousands of new jobs and improvements in public health. 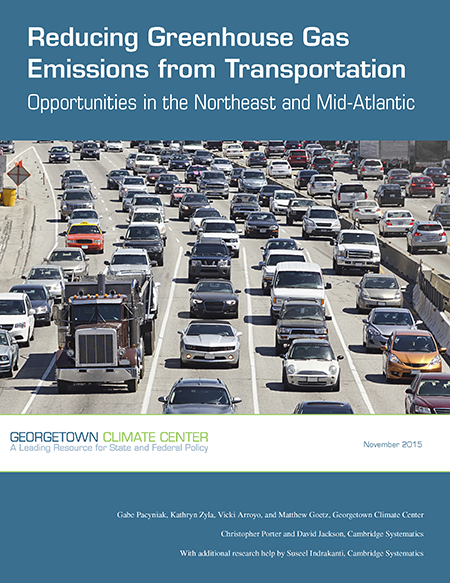 The report, “Reducing Greenhouse Gas Emissions from Transportation: Opportunities in the Northeast and Mid-Atlantic,” analyzes policies and resulting benefits and costs for the 11 northeast and mid-Atlantic states and the District of Columbia that participate in the TCI. The Georgetown Climate Center partnered with Cambridge Systematics to develop the report, which was reviewed by a panel of experts in transportation systems and policies. Existing federal and state policies will achieve significant transportation emission reductions of about 29 percent by 2030 from 2011 levels, but additional policies are needed to achieve greater cuts and to meet previous long-term state commitments to reduce greenhouse gas emissions economy-wide in the northeast. Additional clean transportation investments in clean vehicles, reduced traffic congestion, freight rail and shipping, transit, efficient land-use policies, and cycling and walking would help states in the region reduce greenhouse gas emissions from transportation by 31 to 39 percent by 2030 from 2011 levels. These investments would reduce oil consumption by 4 to 27 percent beyond what would be achieved by existing federal and state policies, and achieve public health benefits, such as reductions in premature deaths and asthma cases—valued at $114 million to $463 million in 2030 in current dollars. A transportation market-based program or pricing policy, such as an emissions budget program, carbon fee, or mileage-based user fee, would increase the range of emission reductions to 32 to 40 percent in 2030, and could generate proceeds to fund the transportation investments. A suite of clean transportation strategies funded by a transportation market-based program or pricing policy would create benefits for the region. Over 15 years, businesses would save $28.7 billion to $54.5 billion and consumers would save $3.6 billion to $18 billion. These cost savings from reduced fuel consumption, congestion, and consumer incentives would more than offset increased vehicle costs and fees. Such changes would increase the gross regional product by $11.7 billion to $17.7 billion, increase personal disposable income by $9.4 billion to $14.4 billion, and create 91,000 to 125,000 new jobs. Delaware Gov. Jack Markell said his state was ready to work to develop additional policies to cut carbon pollution from the transportation sector, stressing the importance of regional cooperation. Many northeast and mid-Atlantic states have already reduced carbon pollution from the power sector by 40 percent since 2005 through the Regional Greenhouse Gas Initiative. "Delaware has been a leader in reducing greenhouse gas emissions from the electricity generating sector,” said Governor Jack Markell. “We have cut our emissions by more than 30 percent, thanks to strong policies that have increased our deployment of solar energy by more than 6000 percent over the past six years and to a switch from coal to natural gas. However, reducing emissions from transportation remains a stubborn challenge, not only for greenhouse gases but also for other pollutants that cause air quality problems. We have taken some good steps, such as offering incentives to buy electric and natural gas fueled vehicles, installing charging and fueling stations, and investing in innovations to create smart transportation infrastructure. But we will need to do more to make a significant difference. We welcome the great work of the Georgetown Climate Center and its partners in developing thoughtful approaches to help meet this challenge and look forward to partnering with other TCI states on next steps." Rhode Island Governor Gina Raimondo also praised the regional effort to reduce greenhouse gas emissions from the transportation sector. “We’re proud to join our partners in the region to grow the clean energy economy and improve our environment,” said Gov. Raimondo. “Rhode Island is leading the way and creating jobs with the construction of the nation’s first offshore wind farm, and we continue to invest in clean energy initiatives that increase our state’s use of renewables and reduce our overall energy consumption. The transportation sector contributes nearly one third of greenhouse gas emissions in Rhode Island. Quantitative aspects of the analysis which informed the report being released today were conducted by Cambridge Systematics. Cambridge Systematics is an independent firm that specializes in analysis and planning in the transportation sector. The firm has served as consultants to more than 44 states and to federal agencies, and led the analysis for the United States Department of Transportation’s 2010 Report to Congress on Transportation’s Role in Reducing U.S. Greenhouse Gas Emissions. The firm also authored the 2009 report Moving Cooler: An Analysis of Transportation Strategies for Reducing Greenhouse Gas Emissions. Our states are committed to addressing the critical challenge of climate change, which is already affecting our states and communities. To meet this challenge, we will need to achieve significant reductions in greenhouse gas emissions from all sectors of our economy. Our states have already made significant progress, but more work needs to be done. Since 2010, our states have been working together through the Transportation and Climate Initiative to develop the clean energy economy and reduce greenhouse gas emissions in the transportation sector. The TCI has developed into a robust partnership with a proven record of accomplishment, including launching the Northeast Electric Vehicle Network; carrying out a program of research to promote sustainable communities; completing analysis of freight flows throughout the region; and working to address barriers to the use of information technologies supporting clean transportation. A recent report by the Georgetown Climate Center provides information on potential economic and emission reduction benefits that could be achieved through clean transportation policies in the region, suggesting that substantial greenhouse gas emission reductions on the order of 29 to 40 percent from 2011 levels by 2030 may befeasible on a regional level and could bring economic benefits to our states. Our states will work together through the Transportation and Climate Initiative to develop potential market-based policies that, when combined with existing programs, are targeted to achieve substantial reductions in transportation sector emissions and provide net economic benefits. View additional supportive statements from New Hampshire and Maryland.